Annexin A10 is the latest identified member of the annexin family of Ca2+- and phospholipid-binding proteins. In previous studies, downregulation of annexin A10 was correlated with dedifferentiation, invasion, and tumor progression, pointing to a possible tumor suppressor role. However, the biochemical characteristics and functions of annexin A10 remain unknown. We show that annexin A10 displays biochemical characteristics atypical for an annexin, indicating a Ca2+- and membrane-binding-independent function. Annexin A10 co-localizes with the mRNA-binding proteins SFPQ and PSPC1 at paraspeckles, an only recently discovered nuclear body, and decreases paraspeckle numbers when overexpressed in HeLa cells. In addition, annexin A10 relocates to dark perinucleolar caps upon transcriptional inhibition of RNA polymerase II. We mapped the cap-binding function of annexin A10 to the proximal part of the core domain, which is missing in the short isoform of annexin A10, and show its independence from the remaining functional type II Ca2+-binding site. In contrast to this, paraspeckle recruitment required additional core regions and was negatively affected by the mutation of the last type II Ca2+-binding site. Additionally, we show that overexpression of annexin A10 in HeLa cells increases their sensitivity to apoptosis and reduces colony formation. 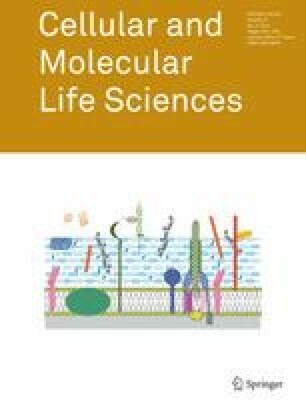 The identification of unique nuclear and biochemical characteristics of annexin A10 points towards its membrane-independent role in paraspeckle-associated mRNA regulation or processing. The online version of this article (doi: 10.1007/s00018-013-1375-4) contains supplementary material, which is available to authorized users. We thank Annette Janning for technical assistance. Rabbit polyclonal anti-annexin A10 antibody was generously provided by Reginald Morgan (Department of Biochemistry and Molecular Biology, University of Oviedo, Spain). This work was supported by grants from the Interdisciplinary Clinical Research Centre of the University of Münster (IZKF, RE2/017/10) and the German Research Foundation (DFG, RE2611/2-1, SFB 629/A1) to V.G. and U.R.